Rock ‘n roll is all about release. Call it what you will; it’s all about transcendence. And it’s difficult to come by, even when you try. 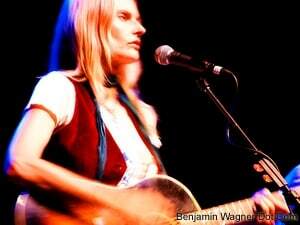 I’m not entirely sure Aimee Mann was shooting for any sort of transcendence at last night’s Highline Ballroom show. Her defiant avoidance of it, in fact, may have been a fairly radical choice. Or it may have just been a bad call. I’m not sure. Of course, Mann’s solo career has been stridently independent and largely random from the start. There was no shortage of sing-a-long hits after ‘Til Tuesday (“That’s Just What You Are,” “Long Shot”), still, she wrestled with floundering major labels for years. It wasn’t until PT Anderson’s “Magnolia” soundtrack and her Grammy showdown with Phil Collins that her solo — and completely DIY (Mann helms her own label) — career took off. I’ve seen her perform half a dozen times since then, and — though her songs are prosaic, poetic, and precise– her performances are always upbeat sing-a-longs. Not so last night. Her set was full of oddly esoteric song choices and beautifully melancholy arrangements. But it never really left the ground. If there was anything remotely close to release or transcendence at last night’s show, it was her mid-song banter. As always, Mann was hilarious. Having pre-taped a segment on “The View” early yesterday morning, she was full of material. She didn’t so much sound like a douche bag, though, at least when she was singing. She just sounded ambivalent. Despite the apparent lethargy, I was smiling as the crowd thinned and the show wound down; she’s still an amazing performer whether embracing anthemic rock, or playing to her coffeehouse doldrums. Moreover, though, I found her song choices fascinating. When she closed with “How Am I Different,” it dawned on me that perhaps the arc of her set (which, make no mistake, every performer considers carefully) was somehow written to answer that very question. I walked out scratching my head, trying to decide if she’s just played a bummer of a show, or made some sort of hugely punk rock statement.